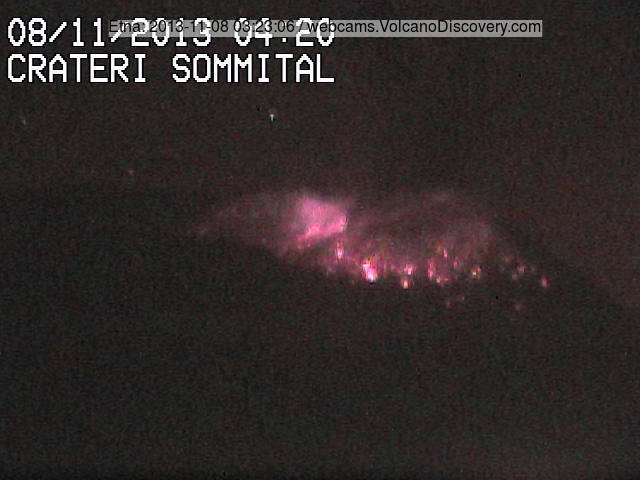 Etna (Sicily, Italy): Explosions from the New SE crater continued over night and this morning, although their frequency and size has decreased. Tremor levels have remained essentially unchanged and are still low. Yasur (Tanna Island, Vanuatu): Strong semi-continuous ash emissions and relatively strong strombolian explosions that eject large bombs outside the crater were reported by John Seach, a regular visitor to the volcano. The ash falls damage vegetation near the volcano and some ash fall was reported from Erromango Island located 150 km north of Yasur. John mentions large lava bombs of 4 meters in diameter. Momotombo (Nicaragua): A small seismic swarm occurred at the volcano today. A cluster of small earthquakes of magnitudes around 1 were detected on 6 Nov under the southern flank.